Last weekend we took our annual summer trip to New Orleans to visit my family. This year, we also caught the last weekend of JazzFest, which is not just great music, but also great food. I tried the much talked about cochon de lait po-boy and instantly fell in love with it. 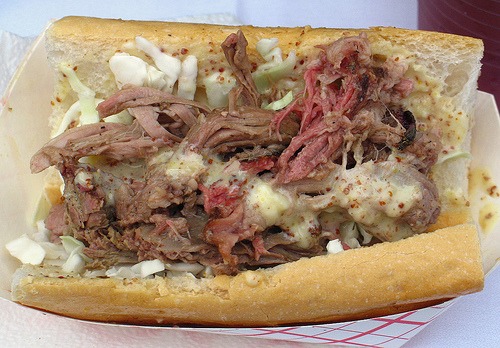 Who woulda thunk that shredded pork, cold cabbage and horseradish sauce on french bread could taste so good? While we're on the topic of food, we visited the Whole Foods in New Orleans and were reminded how much we'd love to live near one of these "food amusement parks". We do have Fresh M arket and it's fine, but it's not the same. 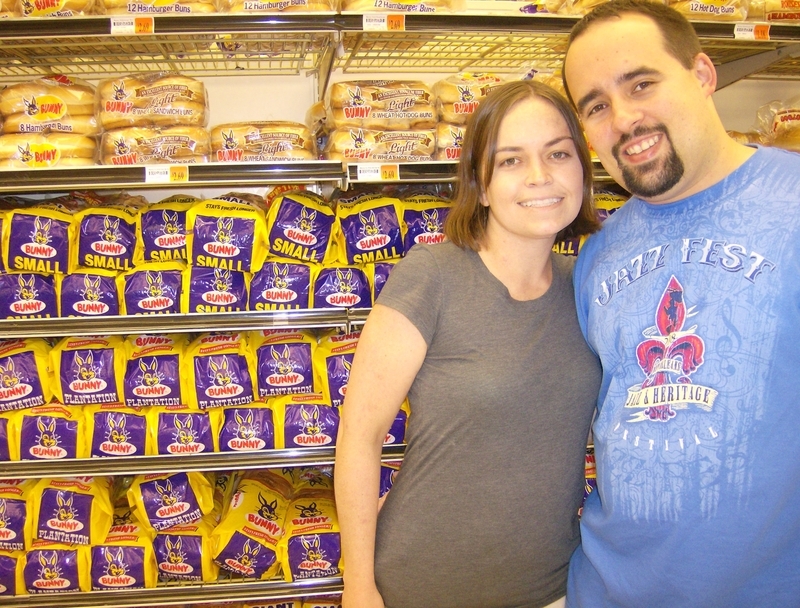 On a visit to Rouses, a local grocery chain, we posed in front of loaves of Bunny Bread. Growing up in New Orleans, Bunny Bread was synonymous with white bread like Xerox is to copies or Kleenex is to tissues. Switching back to the local restaurant scene here, we did check out two restaurants in recent weeks with one hit and one miss. First, the hit. This past weekend, we decided to spend a day exploring Jacksonville. Some reading beforehand on Chowhound suggested that Mojo Bar-B-Que was worth trying. The self-styled "southern blues kitchen" didn't disappoint. I ordered a plate of pulled pork and smoked turkey with coleslaw, corn and cheese grits (can't pass up cheese grits). The pork was tender and the turkey slices were tasty. 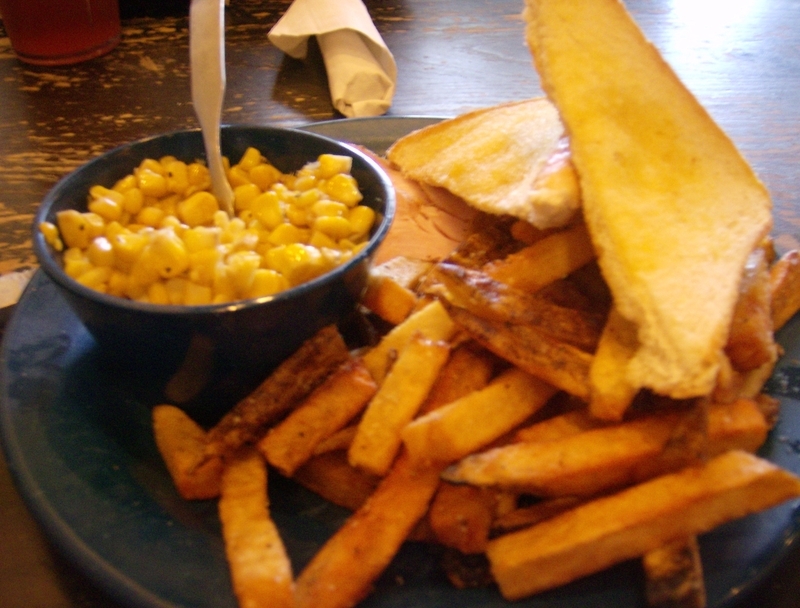 Traci ordered smoked turkey with fries and corn. The corn was knockout and you could see that it had just been cut from the cobb. Mojo's does a variety of sau ces. Our favorites was the mojo, chipotle and mustard-style sauces. Prices were reasonable for the amount of food we got. The server was good and the atmosphere (casual, clean with a laidback, bluesy motif) fit nicely with the food. If Mojo's wasn't all the way in Jacksonville, we'd become fast regulars. The miss was unfortunately closer to home. Again, thanks to a positive comment on Chowhound, we decided to try S.O.B. 's of Newberry for dinner one night this past week. Browsing S.O.B. 's website, the place sounded perfect. S.O.B. 's cutely stands for Shrimp, Oysters, Beer. Plus, it is apparently owned by the same restaurateur tha t was behind Mark's Prime downtown and M.T. 's Chophouse. Unfortunately, our dinner was a disappointment. First off, the place felt like the A/C was broken. Second, our server was sweet, but announced it was her first day and didn't know the menu. I ordered the all-you-can-eat fried shrimp special and Traci went with chicken fingers. While it's hard to go wrong with fried shrimp and I thought the shrimp tasted fine, both of us agreed that the fries and coleslaw were pretty blah. The prices are good and we wanted to like the place, but the food certainly didn't match with expectations. As always, drop me a line with your favorite independent restaurants in Gainesville and beyond.